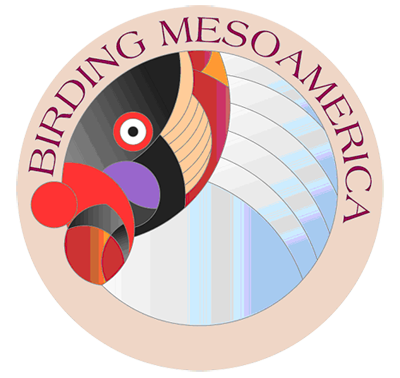 That’s right, I’m going to the First Annual Mesoamerican Birding Festival. Now while Mike has enjoyed birding the neotropics (the sub-tropical and tropical parts of the New World) and Charlie has birded, well, pretty much everywhere, I have never birded outside of the temperate zone. While I am set in terms of the field guides I’ll be using and have studied hard to get a slight grasp on the birds I might see (Resplendant Quetzal has me drooling already) I am still worried about what to bring with me. While the festival organizers have shared with me a useful checklist of things to bring, and Julie Zickefoose, who is also going on the trip, has been helpful, I figured that asking 10,000 Birds’ diverse and knowledgeable readership would be helpful too. Right now, my list of birding-related equipment to bring includes my camera, several lenses, extra memory cards, my binoculars, my scope and tripod, two field guides (Ber Van Perlo’s Birds of Mexico and Central America, part of the Princeton Illustrated Checklists series, and Steve Howell and Sophie Webb’s A Guide to the Birds of Mexico and Northern Central America), John Kricher’s A Neotropical Companion, my optical cleaning kit, pens and a notebook. I will most likely be bringing my laptop for downloading the pics I get and to occasionally blog and check email while I am in Honduras (there will be much more blogging upon my return). In terms of clothing I plan to bring a full complement of underwear and socks, a couple pairs each of cargo shorts and cargo pants, several T-shirts, some long-sleeved shirts, a single hooded sweatshirt or windbreaker, a couple of caps, a pair of flip-flops, and a pair of sturdy New Balance sneakers. I am still debating whether or not I am going to take malaria medication or get my doctor to provide me with doxycycline in case it seems like I am getting malaria and cyprofloxacin in case I start to, umm, leak from my nether regions. I will also be bringing over-the-counter pain medications and anti-diarrhea medication, sun-tan lotion, bug spray and a small first-aid kit. We’ll be birding everything from hotel grounds to cloud forests to mangrove swamps to Mayan ruins to straight-up rain forest. Temperatures should top out in the high eighties and bottom out in the high sixties (Fahrenheit). I expect rain and sun to alternate. Hot, humid weather makes me sweat like a horse but I imagine I’ll be able to survive the heat: the real question is if I will survive the joy of seeing what folks I have talked to estimate will be over 200 life birds, to say nothing of a variety of mammals, bugs, plants, reptiles, and amphibians. So, what am I forgetting? What advice do you have for a first-time neotropical birder? What are the odds of my head exploding? What should I look out for? What should I be sure to see? mangrove swamp = lots of mosquitos = long pants and long sleeved tops. Oh man, I’m drooling too! My advice = Take an African with ya! I didn’t take precautions for malaria when I went to CR, but a friend did in Ecuador and I might in Honduras. Apparently it makes you a bit queasy, but weighted against dying of malaria, queasiness is tolerable I guess. I’d say leave the Kricher book home but read it before hand. It’s pretty large if I recall (although mine is mysteriously missing from my bookshelf…) Definitely bring some good breathable, packable raingear. I’ll send you my Costa Rica packing list if I remember to later. Ha ha. Your enthusiasm is completely unbridled and rivals mine when I did my first tropical birding trips last year: Belize and Honduras. Talk about head exploding! Honduras is a lovely country and you’ll visit some of the best birding places with the itinerary. Pico Bonito lodge and park is amazing…I cannot get the vision of the Lovely Cotinga out of my head….i climbed the observation tower in back of the lodge up 4-5 stories to look out over the green mountains and FAR off the distance was this electric torquoise blue bird with a purple throat and heart-shaped purple patch on its lower chest. It’s torquoise “echoed” out over the sea of green foliage. I hope you enjoy the festival, I am sad I cannot make it myself. Just be wary of the huge snakes that make their way up the steps of the lodge…. : ) No foolin! Hope you have a great time, I’m sad I cannot make the trip myself! You’re carrying too many books: read John Kricher’s book before you go, leave the PIChecklist at home, and make enough notes that you can figure things out when you’re back in your room. You might also be overpacking clothes: I never wear shorts in the tropics, and tend to get by with just a pair of quick-dry ‘cargo’ pants and some cotton pants for the evenings. I’d lose the hooded jacket and windbreaker in favor of just a gortex rain jacket. You need only one cap; if it gets lost, you can borrow one at the hotel or buy one. You definitely want a headnet against bugs, too. Corey: “I might have to see a doctor about this drool problem I seem to be having…” you’re not thinking about eating the birds are you? If so, see a doctor before the trip. The Neotropical Companion is a great book with lots of info. When my family went to Tiskita Lodge in southern Costa Rica, we reached it via a small plane (a five-seater!) and were limited to 25 pounds of luggage per person. Don’t over pack! @tai haku: long sleeves and pants. check. @Mike: I recommend a twenty-four hour ban on looking at anything but Rochester birds. @Owlman: Daisy would probably be a bit upset with me…and Cliff Claven, great Cheers reference. @Nate: It is a great book…and I’ll decide on what drugs tomorrow after some more consultation with my doctor. @Patrick: Yeah, it doesn’t make sense to lug it all the way there. And breathable raingear, check. @Rick: headnet, check. long pants, check. lots of notes, check. Leave the field guide home? Not sure…but have fun? Absolutely! @Joseph: Only if they try to eat me! And it’s unanimous! Everyone likes Kricher. @Liz: No small planes for me, but I won’t overpack (at least I’ll try not to). Well, I think you should camp out in the jungle (you’ll see more that way, and not just birds) but any which way you bird the Neotropics you’ll have a great time. Have fun with the multitudes of impossible greenish flycatcher tanager things. Learn as many vocalizations in advance as you can – find what you can on xeno-canto. Howell’s is a great guide. Don’t leave it behind, you’ll need it in the field. Have fun, take lots of pictures, and don’t forget to pay attention to the lowly reptiles and amphibians (I can help with ID’s). Hey Corey, I just ran across your post. You’re going to have a GREAT time on this trip! Honduras is a superb destination for a first neotrop trip: loads of new species, but not just insanely diverse like, say, Peru. In other words, yes, your head will explode, but you’ll be able to find and reassemble all the pieces. Pico Bonito is getting a lot of buzz as an outstanding lodge for birding — there’s going to be a feature on it in the next issue of Audubon magazine. Advice: reading Kricher before you go is a great idea; for reading pleasure during the trip, there’s a wealth of text in the Howell and Webb field guide. I’d encourage you to read that guide not just for field marks, but for all the fine info on behavior and habitats of the birds. Every species account includes a heading called “Habs.” which stands for “Habitat and habits,” and it’s worthwhile to read these carefully, as well as reading the family introductions and the book’s introductory chapters. And always in the tropics, pay close attention to the sounds. Voice is even more important there than it is in temperate-zone birding. The late Ted Parker often commented that birding in tropical forest by sight alone was like watching the news on TV with the sound turned off: you miss a lot of what’s going on. Have a fabulous trip, and blog about it so we can share your adventures! I may have mentioned this to you in Massachusetts, but I thought it was really helpful for me in Costa Rica. If you get species lists for the places you’re going, mark the plates in your field guide next to the birds you expect to see and where you expect to see them (I used like M = Monteverde, LS = La Selva, etc). Species in the neotropics are so segregated by elevation and habitat that narrowing them down like that makes things more manageable and not so skull-shatteringly overwhelming. I imagine this would be especially useful in that you’re using the Howell-Webb guide that includes birds all the way up into northern Mexico. That way if you’re faced with some Kiskadee like flycatcher or Woodcreeper, you won’t be wasting your time eliminating a species that’s closest range isn’t within 1000 miles of you. Corey, your list of what you need to bring makes me laugh. It reminds me of my first trips to the tropics and what I now carry. Partly in fun but also serious, have you updated your will? Next of kin know your movements and itinerary and where to contact you any time? This will give them some peace of mind while your head is exploding. @Kenn: Glad I’m going to a place that won’t scatter my skull too far! And, read the heck out of the field guide and focus on sound, check. Blog about the trip, check! @Nate: Come up with a system so I know what I’m likely to see where, check. When you enter the country, the customs officer will give you back the yellow copy a customs form – keep this safe during your trip, you will need it when you leave the country. There are four lines for customs in the San Pedro Sula airport, so if more than one plane arrives simultaneously (about three planes being the maximum capacity for the airport) you’re in for a wait. Make sure to have some cash when you leave. There is a departure tax, it was $35 as of December this year and only cash is taken. Do not drink any water except AGUA AZUL or MERENDON. I have never taken any malaria preventative. Avoid attracting too much attention. Keep a low profile and stay safe. Some common birds that you’ll likely find in disturbed areas (in no order) include Olive-throated (Aztec) Parakeet, White-fronted Parrot, Ruddy Ground Dove, Inca Dove, White-winged Dove, Red-billed Pigeon, Turquoise-browed Motmot, Social Flycatcher, Great Kiskadee, Tropical Kingbird, Greyish Saltator, Black-headed Saltator, Red-throated Anttanager, Montezuma Oropendola (which makes the strangest noises of any bird ever), Great-tailed Grackle, Altamira Oriole, north American migrants (especially empidonax flycatchers and warblers esp. Dendroica) and Summer Tanager (abundant), Baltimore Oriole, scrubby disturbed areas will have Yellow-breasted Chat and Blue Grosbeak, Grey-crowned Yellow-throat (which have barely or dont have eyearcs in these parts)…Mangrove Swallows are among the swallows around San Pedro Sula airport and you’ll get the first Tropical Kingbirds in the field by the airport in San Pedro Sula. I don’t know where to begin as far as “real” habitats. Cloud forest: common bush-tanager, Resplendent Quetzal, Scaly-throated Foliage-gleaner, Golden-browed Warbler, Spot-crowned Woodcreeper, Unicolored Jay, just to name a very few. Around Lago Yojoa, keep your eyes peeled for the prize of a Spotted Rail. Around the lake, enjoy the wonderful ambiance and the wonderful birds – common birds around here include Spot-breasted Oriole, Yellow-winged Tanager, three species of kingfisher, many Least and Pied-billed Grebes, Bare-throated Tiger-heron, great numbers of Northern Jacana, Fork-tailed Flycatchers. I suggest that you check all the Turkey Vultures around the lake for Lesser Yellow-headed Vulture which can sneak by if you don’t look carefully. Beware this stupid problem, I think it’s extremely rare but I feel I should mention it: I once was looking at some birds and I stepped off a trail to get a better view…suddenly my leg was smitten with pain and I looked down to see zillions of fire ants climbing me and biting as they went! So watch where you step…this occurred in the Merendon mountains by San Pedro Sula. The path was paved, it was by the white “Coca Cola” sign which you’ll probably see from the city. Big snakes and tarantulas occur but they are NOT common, in fact seeing them is rare. Speaking of Pico Bonito, some things to look for include the Crested Guans and Great Currasow up on the loop trail (take a gentle pace or they will fly away in the case of the guans, run away in the case of the Currasow), the trees behind the pool often have the Lovely Cotingas, keep your eyes peeled for the prize Keel-billed Motmot, the low trail parallel to the stream has many White-collared Mannikins, try to be on one of the tall platforms around 11:00 am-noon – Ornate and Black Hawk-eagles like to soar at that time, and though I’ve not set eyes on one the tremendous Black-and-White Hawk-eagle is said not to be as rare here as it is elsewhere in the world…basically you can see very, many birds at Pico Bonito…talk to the manager, James, who is a great guy (from NJ!) and he can give you the rundown on some of the latest sightings. Let us know what you see!!!!!! I really want to hear what you have to say about Hotel Las Glorias and Lancetilla, where I haven’t visited yet. Have a fantastic and wonderful trip!!! You will almost surely see Ferruginous Pygmy Owl, which is a common bird in a lot of the neotropics. Their call is extremely easy to immitate exactly (a bunch of sharp whistles on the same pitch) and it is an extremely effective way to draw in small birds. I suggest learning to immitate it, which will take about 2 seconds. HI Corey — sounds positively wonderful…….. I look forward to reading about your adventures. 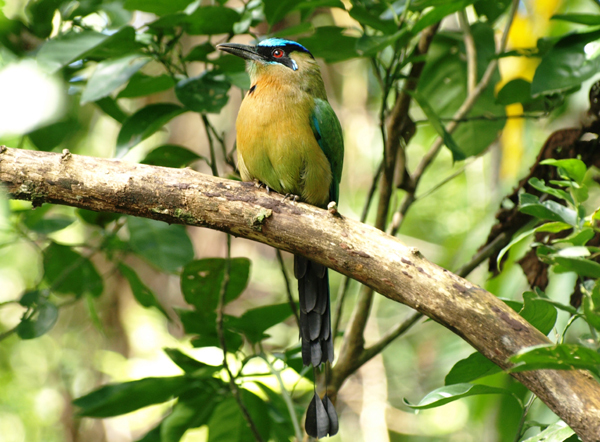 Would love to see the blue crowned motmot and any other exotic birds you will see. @Austin: Thanks for all the advice! @Tom: No problems with that suggestion at all! After the trip (sigh) people suggested wearing surgical gloves (the non-latex kind) or sun-gloves. I’d wear them asleep as well – I dreamt that thorns were erupting from the back of my hand a la Wolverine, only to find that the bugs were drilling in. A week later it still itches and the bumps are still there. Hi Corey, I love Honduras – a wonderful country with great people and cool birds. I would seriously not bother about malaria prophylactics. i lived there for a year and only ever heard about rather uncommon cases of malaria on some of the islands, and right on the coast (Tela, La Ceiba, Mosquitia). If you do happen to have annoying little sand flies, dont even bother with DEET. It will just poison you and the environment and do nothing for the sand flies. buy a little $1 bottle of baby oil and lightly cover all exposed areas. this is the only remedy that i found to work (incidently, I learnt this while i was living in Tiskita in Costa Rica – the same place Liz mentioned). You are likely to find the humidity rather intense. Walk slowly. There is no need to rush. Walking slowly will help to keep your clothes dry, and give you a whole lot more time to appreciate the birds and sounds of the forest! Hmmm Ive lived here all my life and i can assure you, dont drink the local water unless its bottled…like they said Aguazul is the way to go. dont worry much about malaria, it aint that common, but some off! is reccomended even though it doesnt work all the time, lots of mosquitoes and sand flies where you are going…. you are gonna be doing lots of close encounter birding in cloud forest and rain forest so dont come with high powered bins….7×35 0r 8×40 anything stronger than that and youll miss some great lil birdies…. lenses and camera…totally, couple of memory thingies cos on a normal day (and i live here) i snap around 150 photos of birds and whatnots, you will probably snap double that ammount. birds youre gonna get…bro, youre going to the field with the best birders in the country so youll be going home with at least some 200 to 300 species including quetzal (which Ive done some research on if you want to chat about the bird, got a tattoo and all LOL).